In the summer of 1835 Isaac Pidgeon located one and one-half mile south of the present town of Salem, Iowa, in Henry County. Other families soon arrived and worshiped together on First Day in the home of Henry W. Joy until log cabin meeting houses were raised. The first Monthly Meeting of Friends in Iowa was opened and held in Salem, Henry County on Eighth Day of the Tenth Month, 1838. Soon Quakers moved on through Iowa developing four strong areas, namely, Salem, Pleasant Plain, Muscatine and Bangor. The fest Quarterly Meeting beyond the Mississippi River assembled May 20, 1848 with Salem, Cedar Creek, Pleasant Plain, Richland, New Garden, East Grove and Spring River participating. This Quarterly Meeting was a part of Indiana Yearly Meeting. The meeting was held in a make-shift shed with raised galleries sufficient to seat 750. The women gathered in the adjoining meeting house at Spring Creek. Between 1200 and 1300 persons gathered for that first Iowa Yearly Meeting. Statistics show the number of Quaker families in the state to be 1500 and estimated 6,000 to 8,000 members scattered throughout Iowa. The first permanent Yearly Meeting House was constructed in 1865 on the west side of North E Street in Oskaloosa. There were by now seven Quarterly Meetings. Within a decade following the first Yearly Meeting there gradually developed a great spiritual awakening among Friends of Iowa Yearly Meeting. This evangelism played a major role in a conservative separation in 1877. It also quickened the spiritual life of the Society. From 1887-1890 (4 years) a total of 7,430 conversions were reported. This also marked the fastest growing period in the history of Iowa Yearly Meeting. By 1892 the membership reached its peak – 12,289 members. Almost immediately, new yearly meetings were set off. 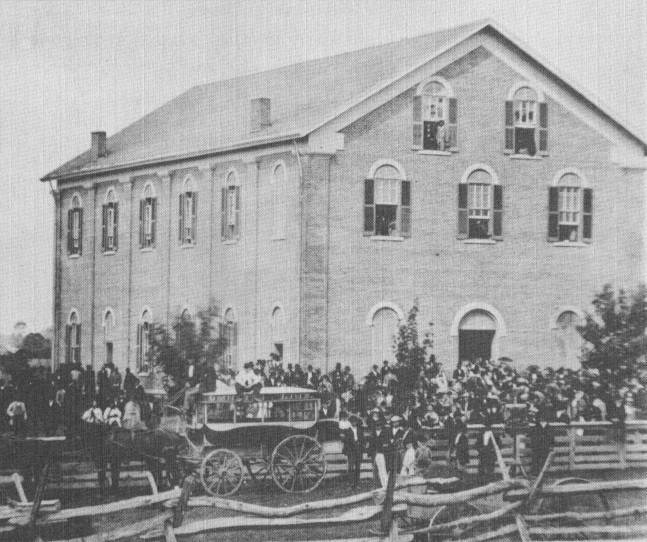 Oregon Yearly Meeting in 1893 with 955 members; California Yearly Meeting in 1895 with 1166 members, and Nebraska Yearly Meeting in 1908 with 1679 members. The evangelistic movement also played a large role in the acceptance of the pastoral system which was officially adopted in 1886. A new organizational structure complemented the pastoral system with John Henry Douglas being appointed General Superintendent and each Quarterly Meeting having an evangelistic superintendent. Women’s Yearly Meeting was discontinued in 1893, when the women joined with the men. The second Yearly Meeting house was built in 1912-1913 at the corner of C Street and College Avenue in Oskaloosa and was to serve as the meeting house for Oskaloosa Monthly Meeting as well. The 50th Anniversary occasion was held on September 5, 1913, in the new Yearly Meeting House. A Junior Yearly Meeting was conducted in 1937 with attendance of 50. 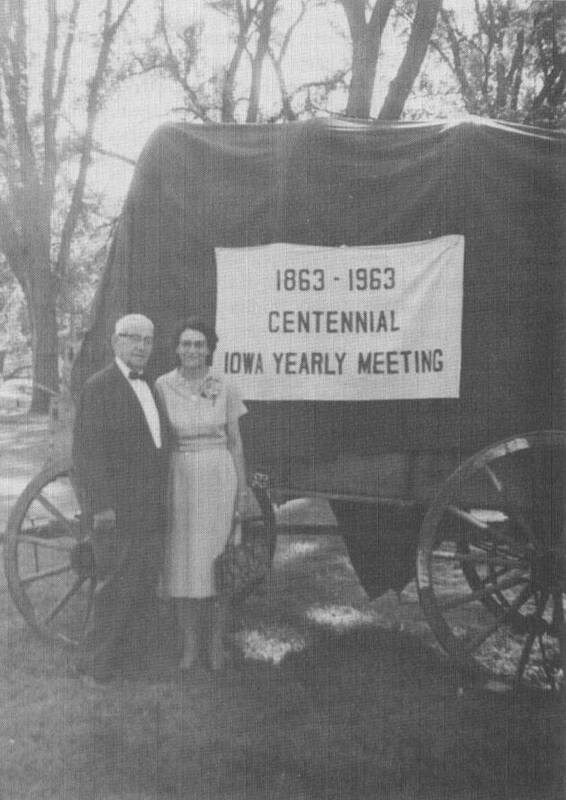 By 1963, when Iowa Yearly Meeting was 100 years old, registration showed 100 attenders with 24 having perfect attendance. 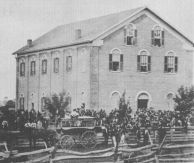 In June, 1844, Pleasant Plain began their first First Day Scripture School – the forerunner of the Sunday Schools. The highest number of such schools was reported to be 88 in 1884. The first Sunday School Standard was adopted in 1915. In 1940 a new Standard for local Sunday Schools was set up, and schools were rated accordingly. Educating their children and youth was always of great concern to Friends as they moved West. During the second half of the 19th century at least 16 academies, seminaries and colleges were founded. By 1925 the last of these was closed as public schools had been established. Penn College, later known as William Penn College, near Oskaloosa, was opened in 1873 and remains open to this date. 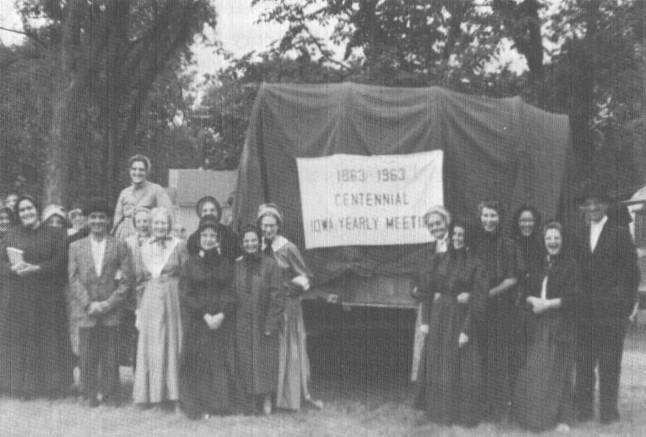 Concern for Missions has been noted throughout the history of Iowa Yearly Meeting. In 1881 Evi Sharpless of Stuart and William Marshall of Bangor sailed for Jamaica where they established a mission station which Friends of Iowa Yearly Meeting considered their special field. In 1911 the Jamaica Mission was placed under the American Friends Board of Foreign Missions, but many from Iowa have served as missionaries there. In 1900 Sylvester and May Jones went to Cuba with the Penn College Missionary Society furnishing their support. The Cuban Mission became a reality and in 1927 a yearly meeting was formed there. By 1963 the political situation had greatly curtailed the work there. Friends from Iowa have also served in Ramallah, Jordan – Willard and Christine Jones, members of Minneapolis Meeting, serving many years. Arthur Chilson of Hubbard, Iowa, was one of three young men who sailed to Kenya, Africa in 1902, selected a location and established the Friends Mission there. Many missionaries from Iowa Yearly Meeting have served there. By 1963, the year Kenya received her independence as a nation, East Africa Yearly Meeting was the largest yearly meeting of Friends in the world. Friends, with their sense of justice, could not countenance the trend of government to exterminate the Indian race. Iowa Friends helped organize the Associated Executive Committee of Friends on Indian Affairs. Later, Iowa Yearly Meeting was given Central Superintendency of Kansas and the Indian Territory by President Grant. Enoch Hoag of Bloomington Monthly Meeting was its first superintendent. Iowa Friends have supplied workers and material aids to the Oklahoma Indian Missions, through the years. Iowa Yearly Meeting Friends have been conscious of both their heritage and responsibility in matters of peace and have felt a concern for serving those in need. They felt a concern for the freedmen following the Emancipation Proclamation and over a period of 34 years aided in education of the black people of the south giving freely of money, possessions and services as teachers. Practical help was given to the Scattergood Hostel which was a haven for refugees until its closing in 1943. In 1883 the Women’s Foreign Missionary Society was formed with Sarah E. Hughes of New Sharon its first president. Name changes include the Women’s Missionary Society and Women’s Missionary Union. The Triennial Conference for the Women’s Missionary Union of the Five Years Meeting was held in the Friends Church at Marshalltown in 1951. Their projects and emphasis has always been prayer, support and education for missions. During the 1880’s and 1890’s a reawakening of Friends brought an organized youth ministry and the introduction of Christian Endeavor. In 1891 the Iowa Yearly Meeting minutes list for the first time a Young Peoples’ Society of Christian Endeavor as a standing organization of the Yearly Meeting with John Hadley as its president. Susan E. Allen was chosen as their Christian Endeavor evangelist to travel among the societies of Iowa Yearly Meeting. The young people supported her financially as well as other mission projects, especially in Jamaica. By 1918 annual Young Friends Conferences in Iowa were initiated. In 1934 the Christian Endeavor Union was organized as a Yearly Meeting standing committee with two advisers appointed by the Yearly Meeting. In 1940 the name was changed to Young Friends Board. At the close of the first 100 years of Iowa Yearly Meeting, there were 46 Friends churches, 13 Quarterly Meetings and 5873 members. The Iowa Friend, published monthly, was its organ of communication.